30mls (Concentrate) = Extra strength.IDEAL FOR clearing MORE DIFFICULT CLOGS ! You will get 220mls Quality Magic Inkjet Flush Print Head Cleaner. THIS MAGIC KIT UNCLOGS INK IN ANY ! 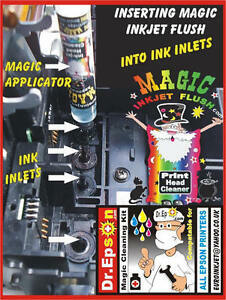 USE MAGIC INKJET FLUSH ON ANY BLACK OR ANY COLOR INKJET.